In Europe, work has long been a symbol of full citizenship and today work is a fundamental goal of European social policy. However, although every person has the ‘right’ to work, it is becoming clearer all the time that unemployment is not due merely to a lack of encouragement to exercise this right, but (at least in part) to some deeper defects in the implementation of effective employment policies. As a contribution to defining the nature of these problems this important collection of essays targets the phenomena of multilevel governance, both vertical (European, national, regional, local) and horizontal (administrative institutions, trade unions, business representatives, NGOs), showing, with detailed analysis and data, how coordination or conflict between the various levels advances, or fails to advance, the goals of employment policy. gender ‘mainstreaming’ as a weakening of the EU guarantee of gender equality. The essays originated in a research meeting held at the Instituto Internacional de Sociología Jurídica at Oñati (Spain) in June of 2007. Some of the contributors, all employment law experts, discuss problematic aspects of the European Employment Strategy (EES) and its influence on the decentralization of employment policies and related elements of social protection. Other authors concentrate on ‘built-in’ multilevel problems resulting from existing constitutional and administrative structures, while a third group focuses on substantive approaches to employment policies within individual member states. The Bulletin contains updated versions of all papers. In this book the degree of administrative, legal, political, and cultural intricacy involved in a serious engagement with multilevel governance of employment on the European model is put on full view. 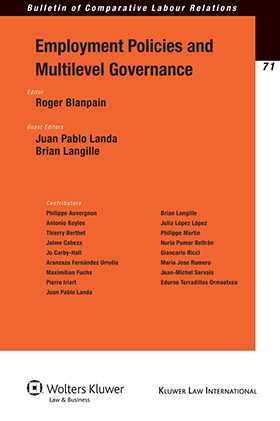 As a deeply informed analysis of how the idea of multilevel governance has played out within the political and administrative reality of Member States, the book will prove of enormous value to labour and employment law professionals anywhere, as the problems identified here have a global reach. Acknowledgments. Notes on the Authors. Introduction. Part I: The Framework Context of Europeanization of National Employment and Social Inclusion Policies. 1. The Impact of Globalization on Employment and Social Inclusion Policies: Experiences and Proposals in Individual European Countries; J.M. Servais. 2. Looking at the EES in Search of the Effectiveness and Efficiency of National Employment Policies and Social Protection Systems; J.P. Landa Zapirain, E. Terradillos Ormaetxea. 3. EES and European Social Inclusion Policy: Employment as a Means of Social Inclusion in an International Human Rights Perspective; A. Fernández, N. Pumar. 4. The OMC as Decentralization of Regulations and Case Law: A Gender Mainstreaming Perspective; J. López López. Part II: Multilevel Governance Experiences on Employment Policies in a Cross-National Perspective. 5. The Reform of the Labour Market and of the Social Benefits for Unemployment in Germany; M. Fuchs. 6. The Reform of the Public Employment Service in France: Modernization and New Governance Issues; P. Auvergnon, P. Martin. 7. Vocational Education Policies in the Process of Multilevel Governance: A French Perspective; T. Berthet, P. Iriart. 8. Facts and Limits of the Regionalization of Social and Employment Policies in Italy; G. Ricci. 9. Centralization and Decentralization within the Spanish Model of Social Federalism: The Examples of Social Assistance and Employment Policies; A. Baylos, J. Cabeza, M.J. Romero. 10. The Jobseeker’s Allowance: A British Perspective on Job Activation; J. Carby-Hall. 11. Who Governs Labour Market Policy in Canada? B. Langille.